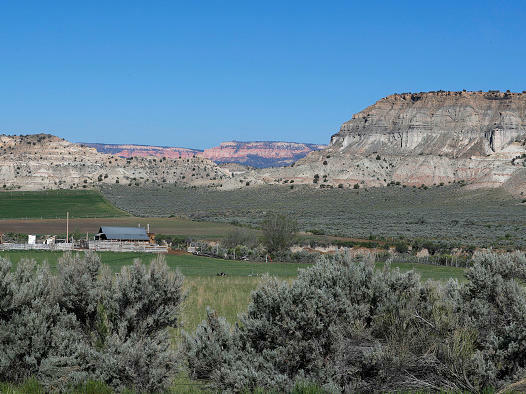 A farm sits at the foot of sandstone formations in the Grand Staircase-Escalante National Monument on May 11, 2017 outside Escalante, Utah. A federal judge has ruled Utah's ban on secretly filming farm and slaughterhouse operations is unconstitutional, striking down what critics call an "ag-gag" law that Utah enacted in 2012. The ban violates the First Amendment's free-speech protections, U.S. District Judge Robert Shelby said. Shelby rejected the state's defense of the law, saying Utah had failed to show the ban was intended to ensure the safety of animals and farm workers from disease or injury. In his ruling, Shelby noted that one of the bill's sponsors in the state legislature, Rep. John Mathis, said the ban was a response to "a trend nationally of some propaganda groups ... with a stated objective of undoing animal agriculture in the United States." The judge noted that another sponsor, Sen. David Hinkins said it targeted "vegetarian people that [are] trying to kill the animal industry." A farmer who supported the ban had said he and his colleagues "don't want some jack wagon coming in taking a picture of them," according to the court's citation of state records. The challenge to Utah ban was filed by the Animal Legal Defense Fund, PETA, and Amy Meyer, the director of the Utah Animal Rights Coalition. Meyer was arrested in 2013 while she filmed workers using heavy machinery to move a sick cow at a slaughterhouse in Draper City. At the time, Meyer was on public property; the charges against her were later dismissed. "I was shocked when I was the one charged with a crime instead of that animal's abusers," Meyer said after the court ruled in her favor Friday. "It should never be a crime to tell the story of an animal who is being abused and killed, even if it's for food." "Utah undoubtedly has an interest in addressing perceived threats to the state agricultural industry, and as history shows, it has a variety of constitutionally permissible tools at its disposal to do so. Suppressing broad swaths of protected speech without justification, however, is not one of them." It's the second time a federal court has overturned a ban on filming at farms: In 2015, a district court judge ruled that Idaho's "ag-gag" law was unconstitutional, violating the First Amendment and the Equal Protection Clause. The Idaho case — Animal Legal Defense Fund v. Wasden -- is currently pending in the Ninth Circuit, after Idaho filed an appeal. Since the 1990s, at least 16 states have adopted "ag-gag" laws, from Kansas, Montana, and North Dakota to Iowa and North Carolina.